The arc of American history is undergirded by a continuous, pointed degradation of the black family. The crux of this is the pervasive mythology surrounding the “missing black father.” At his feet has been laid the blame for poverty, mass incarceration, police brutality, and any number of ills, rather than the real culprit — the systemic, institutionalized racism that defines so much of American life. Despite statistics and studies that contradict this mythology, this archetype continues to cast a shadow on the black community. It’s because of this that the representation of the black father in television holds so much weight. Recent series like the CW’s superhero adaptations, Black Lightning and The Flash, as well as the beautifully rendered southern drama Queen Sugar, have been showcases for complex depictions of black fatherhood. But the arc of the black father in pop culture is most defined by its representation in beloved sitcoms in the 1970s and 1990s. The sharp-tongued James Evans Sr. in Good Times, the highly successful and caring Uncle Phil in The Fresh Prince of Bel-Air, and the perfect representation of middle-class aspiration, The Cosby Show’s Cliff Huxtable, have become iconic for their blend of familiarity, warmth, and representation of the black nuclear family. These sitcoms have guided our conversations about black fatherhood in television, and they’re important for how they refute the noxious mythology of the missing black father. But their episodic nature, and the need of sitcoms to connect with broad audiences, meant they lacked a certain complexity necessary to consider these ideas with further depth. The series I find to be the most personally moving, narratively complex, and politically potent depiction of black fatherhood also happens to be the most underrated: Star Trek: Deep Space Nine. When Deep Space Nine premiered in 1993, it was walking in the shadow of its immensely successful predecessor, The Next Generation, which was still on the air. The series was also entering a politically fraught environment on the heels of the Los Angeles riots, and not far removed from the presidency of Ronald Reagan — a politician who framed black people as stark stereotypes of criminals and “welfare queens,” establishing a cultural understanding of black families that America continues to grapple with. In this context, the DS9 producers’ decision to cast its leading commander (and later captain) as a black man was not just a historic first within Star Trek, but politically resonant in ways that have only deepened over the years. Deep Space Nine would go on to carve a unique path within Star Trek lore, and science fiction as a whole, as a complex, expertly crafted meditation on war and the price of peace that favored multi-season arcs, which amplified its biting approach to Star Trek mythos. In its first season, it was uneven, still getting a hold on the characterization and ideas it would continue to explore. 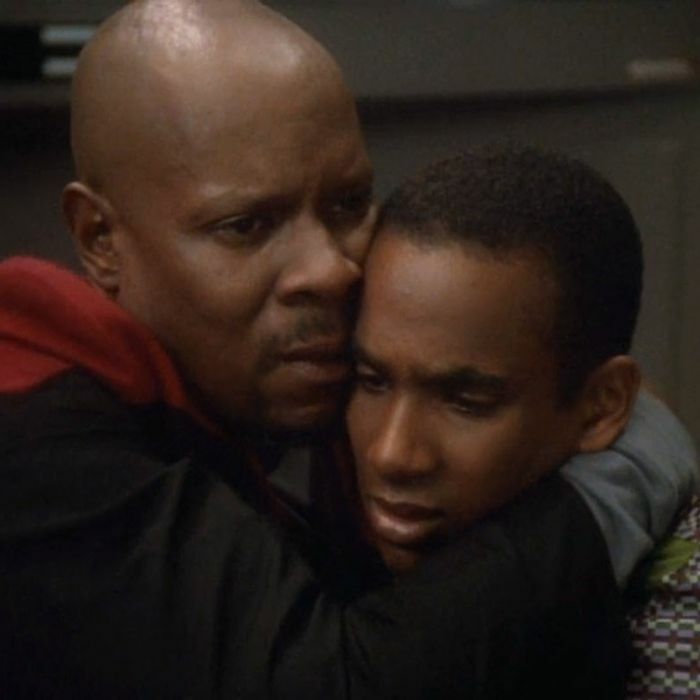 But one aspect of its story immediately felt lived-in and real: the tender relationship between Commander (and later Captain) Benjamin Sisko (a magnetic, theatrical Avery Brooks) and his young son, Jake (Cirroc Lofton). The pilot, “The Emissary,” artfully lays the groundwork for their relationship, introducing Sisko as a widower reluctant to take the position as commander aboard the space station and shepherd the Bajorans, a highly religious people recently freed from a decades-long occupation by the Cardassians, into joining the Federation. His wife, Jennifer (Felecia M. Bell), died during the Battle of Wolf 359 which was headed by a Borg-assimilated Captain Picard (Patrick Stewart), making their first and only meeting in the series an icy one. Both Sisko and Jake are grieving this loss, clinging to each other for stability and familiarity as they enter a strange new environment. When watching “The Emissary” recently, the chemistry between Brooks and Lofton was immediately apparent. They moved and touched one another with a familiarity that struck me as having a deep, emotional history. They felt like a family with an immediacy I’ve seen few actors able to match on television. As Deep Space Nine continued over the course of seven seasons, Sisko and Jake’s relationship took on new dimensions. Jake grows into an empathetic young man who inherits his father’s interests in the arts and becomes a writer. Sisko evolved into one of the most complex characters in all of science fiction. He was a wounded widow and, eventually, beloved husband to his second wife, Kasidy (Penny Johnson), a righteously determined Starfleet captain, and a man aware that for this war to be won, he would have to sacrifice his own morality for the sake of progress. Brooks gave Sisko his trademark bombastic intensity and gravitas. He made his monologues feel theatrical while never sacrificing the core of their emotional impact. But there was also something about the quieter moments, where his face would melt into a broad smile whenever he saw a child or held Jake in his arms. Sisko’s love for Jake provided a poignant contrast to the temerity and flinty brio he portrayed as a captain. Ira Steven Behr, who took over as showrunner in 1995, and the inventive writing staff, which included creators like Ronald D. Moore, never lost sight of the fact that the heart of Sisko’s character would always be his love for Jake. Conversations about representation in pop culture often feel like too much of a number’s game. Whittling the value of a series down to who stars in and who creates these works can be useful when looking at the culture more broadly. But it doesn’t tell us about the soul of the work — how it speaks to its audience, the history it reflects, the artistic risks it’s willing to take in order to not only represent minorities, but to speak to their experience with care. The impact of Deep Space Nine goes beyond the casting of black actors like Brooks and Lofton in these pivotal roles. The series boldly interrogated blackness within the arc of American history through their characterization. Like my maternal family, Sisko was from New Orleans and took pride in his heritage, often cooking Creole recipes from scratch that he learned from his chef father. When I see three generations of the Sisko family onscreen in episodes like the season-four two-parter “Homefront” and “Paradise Lost,” a tinge of wonder rises in me. How often have we seen a black family given such importance, depth, and cultural weight on a television show such as this? Last fall, I went to Syracuse University to speak with a small group of journalism graduate students. I was given the opportunity to host a screening, and I decided on the season-six Deep Space Nine episode “Far Beyond Our Stars,” one of the most stunning installments in Star Trek history for its willingness to push the boundaries of genre to interrogate racism and America’s past, not to mention Brooks’s exceptional work as both director and star of the episode. In the episode, strange visions from the Prophets begin to take over Sisko’s life and he imagines himself as Benny Russell, a science-fiction writer in 1950s New York, writing a story about a space station known as Deep Space Nine. At first, the episode may seem like a clever way to watch the cast members outside of their usual makeup and prosthetics, but it reveals itself to be a sincere meditation on black identity, racism, and how black people have not been allowed to imagine their future selves. In the 1950s plotline, Jake isn’t Sisko’s son, but a slick-talking street hustler known as Jimmy. The episode builds to a gut-wrenching emotional turn that always moves me to tears: Jimmy/Jake is gunned down in the street by cops, sending Benny/Sisko into an emotional breakdown. He barrels toward Jimmy’s lifeless body, covered in blood. When Benny grows angry, the cops take the opportunity to brutalize him. Weeks later, Benny finally decides to go to the office to see his story about Deep Space Nine — which he cherishes because it allows for a hopeful future for black people — first published, only to find out it won’t be going to print. Benny launches into a monologue about the power of his idea with a beautiful intensity that echoes with the voice of every black man beaten down by a system that survives on their suffering. When the episode finished airing at Syracuse University, I was approached by a black professor who sat in on the screening. He was deeply moved by Brooks’s performance, the audaciousness of his direction, and the political resonance of the story line, which tackled everything from police brutality to the devaluing black creativity. “Why didn’t this man win any Emmys?” he asked ecstatically. We spoke at length about how Sisko and his relationship with Jake is one of the more unsung revolutionary turns in television history and why it cuts so deeply. No series before or since has a portrayed a black father with such complexity, crafting him as a widow, a powerful authority figure, a religious icon, a man whose morals are formed in shades of gray and whose love of his son remained his guiding principle. The beauty of their relationship is perhaps never better portrayed than in the season-four episode “The Visitor.” The episode is framed by an elderly Jake Sisko (played with touching melancholy by Tony Todd), now a successful writer living in New Orleans, burdened by regret. He reflects on a freak accident aboard the USS Defiant that seemingly took the life of his father when he was young. Sisko is actually stuck in some strange pocket dimension, never growing old and intermittently able to break away to witness his aging son’s life. Jake spends the rest of his life trying to find a way to save Sisko, sacrificing his career as a writer and even his marriage to do so. “The Visitor” brings to the fore what separates Deep Space Nine from the more widely praised representations of black fatherhood: its continued dedication to revealing the emotional vulnerability of the black family at its center. Throughout “The Visitor,” Sisko and Jake laugh, weep, and reveal just how deep their love goes for one another. Seeing black men cry, grapple with the historical importance of their existence, and remain beautifully, dynamically human is something no other science-fiction series on television has done with such panache. What makes the bond between Sisko and Jake one that is both culturally revolutionary and emotionally resonant is the chemistry between them, brought to life by the actors and the tenderness of the writing. The family they represent is wholly unique on television: a window into the future of black identity that never forgets the trials of our past or the complexity of our humanity.